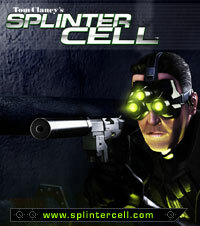 You control Sam Fisher, a field operative of an NSA sub-agency called Splinter Cell. Sam is sent into action when the tiny nation of Georgia invades Azerbaijan, and has to declare war to the USA. Technology-based terrorism, Internet propaganda, the live web-cast executions of U.S. soldiers, and other acts of information warfare draw the U.S. into a worldwide 'high-tech Vietnam,' in which their enormous size and reliance on technology only make them more vulnerable. America discovers that the future of warfare is a fight that armies cannot win; only individuals stand a chance. Using a third-person perspective and intuitive control scheme, Fisher uses stealth, disguise, cutting edge espionage gadgetry, powerful weapons and non-lethal weaponry to complete counter-terrorist operations the U.S. government cannot acknowledge. Splinter Cell is a covert intelligence action title featuring an original story and characters inspired by the work of Tom Clancy and approved by him. Established music composition composed by Michael Plowman; composer of the Lord Of The Rings DVD special soundtrack and a Clio award winner. Intense stealth experience using stunning light-shadow and sound effects, intelligence gadgets (thermo goggle, sticky camera, etc) and other costumed artificial intelligence features.